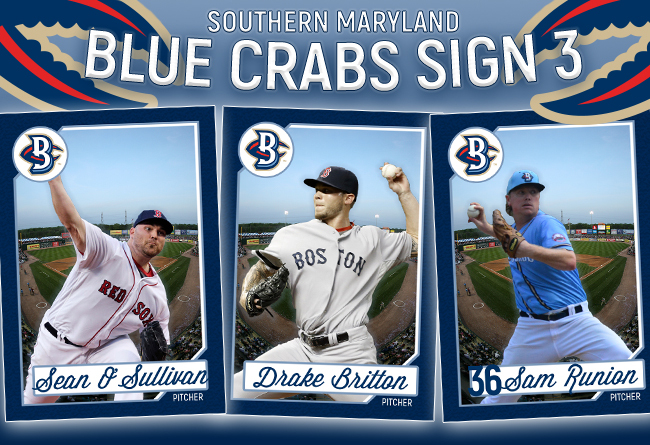 (Waldorf, Md., March 21, 2018) - The Southern Maryland Blue Crabs have announced the return of right-handed pitcher Sam Runion and the signings of right-handed pitcher Sean O’Sullivan and left-handed pitcher Drake Britton. Runion rejoins the Blue Crabs after appearing in 52 games during the 2017 season. During his first campaign with the team, the right-hander reliever went 3-2 on the year, picking up a save as well. Runion came on strong late in the season, allowing just one run over his final 20 outings, including a 1.23 ERA in the month of September. The Asheville, North Carolina native was a 2007 second round draft pick by the Kansas City Royals. After seven seasons in the Royals organization, Runion signed with the Tampa Bay Rays in 2014. After nine games with the Rays AA affiliate, Runion joined the Washington Nationals organization, where he spent the next three seasons. The 30-year-old O’Sullivan comes to Southern Maryland with seven years of MLB experience under his belt. The right-hander was originally a third-round pick of the Los Angeles Angels in 2006 out of Grossmont College. O’Sullivan made an impact right away, going 4-0 with a 2.14 ERA in his first professional season, being named a Post-Season All-Star for the Orem Owlz. The starter quickly worked his way up the ranks of the Angels organization, making his MLB debut in 2009 as a member of the Angels. His debut came on the road against the San Francisco Giants, where he fittingly picked up the win on Irish Heritage Night. Britton joins the Blue Crabs by way of the Bridgeport Bluefish Disposal Draft. The 28-year-old made his Atlantic League debut in 2017 with the Bluefish, going 4-1 with a 3.68 ERA. Britton made 34 appearances out of the bullpen last season, the highest total for a left-hander on his team. The southpaw was drafted out of high school by the Boston Red Sox in 2007. Working as a starter at the time, Britton climbed the Red Sox ranks, being named an All-Star at the AA level in 2013. This led to the Red Sox bringing Britton up to the majors later that season, working 18 games in relief for the eventual World Series champions that season.